Offenbach is the Grand Maître of French operetta and Orpheus in the Underworld, his irreverent parody of mythology’s greatest lovers is his masterpiece, boasting an effervescent score culminating in the celebrated ‘can-can.’ Orphée aux Enfers will be sung in the original French with new English dialogue by Michael Patrick Albano who also directs. This new production is choreographed by Anna Theodosakis and designed by James Bolton (scenery), Lisa Magill (costumes) and Wesley McKenzie (lighting). The UTSO will be conducted by renowned Canadian baritone Russell Braun in his conducting debut for the Faculty of Music. Made possible through a generous gift from David G. Broadhurst. Additional support provided by Marina Yoshida in honour of Michael Patrick Albano. UofT Opera’s annual giving program. 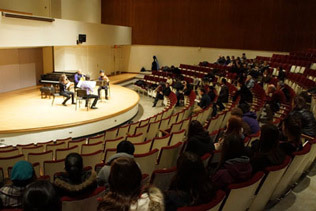 Opera Talk, a pre-performance lecture, will be given half an hour prior to each MacMillan Theatre performance in Room 130. All MacMillan Theatre productions are given with Surtitles.